Hello, this is Michael Ginsberg, president of 3Gstore.com, filling you in on how we are dealing with the storm that hit a few days ago. A pretty massive storm knocked out power, internet and TV for hundred of thousands in Chicago and at 3Gstore.com, we were able to use Verizon LTE & PepLink Balance 30 to keep our warehouse in business during the 2 day outage (BTW a great case study why every business should have a wireless failover). On Day 3 of the storm, my house lost all internet and TV. Normally, this isn't a big deal, BUT today was the semi final game of the FIFA World Cup and the US team is playing. My twin girls are on a travel soccer team and LOVE soccer, especially watching Abby Wambach, Hope Solo and the whole US team. The bad news is that cable is OUT for the whole neighborhood and we cannot miss the game. I grab a Verizon 4510L LTE 4G MiFi and an Extended Battery for the 4510L (so the MiFi will work for 10 hours vs. 3) and head home. Within minutes I grab the largest screen iMac I have, move to the family room, hook up to the MiFi and log into ESPN3.com. Within minutes, the soccer game is being streamed via LTE. 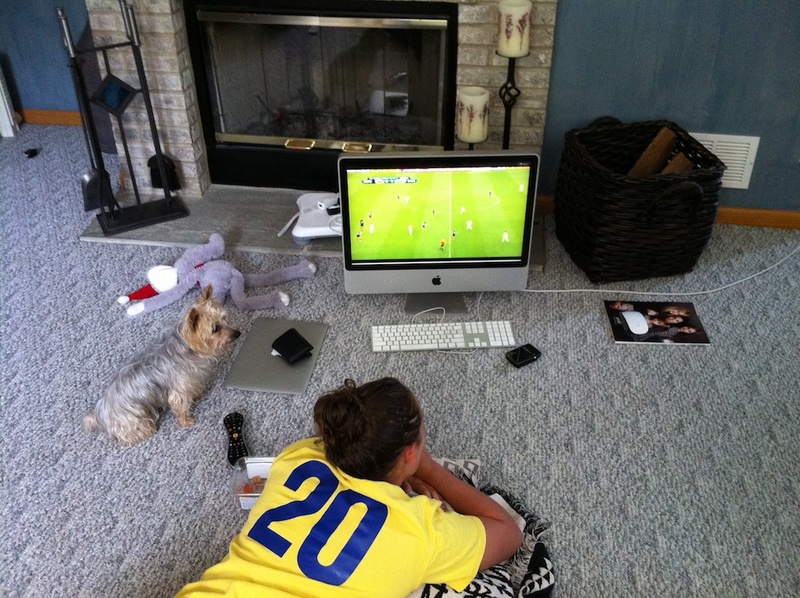 Pictured above is my daughter Erin (#20 is also Abby Wambach) and my dog named Hope (after Hope Solo), can you tell we love soccer? To the right of the keyboard is the MiFi and Extended battery, which allowed us to stream the game to the large screen. The day was saved, the US won and they are one game away from being World Champs.